Arcade Frontier is an online gaming website that offers you a variety of arcade games for free. There is also a premium game section and in order to play them you need to install Arcade Frontier add-on. Our security researchers classify Arcade Frontier as adware, and it means that if you are a security-minded computer user, you will consider removing Arcade Frontier from the PC. It is not malicious computer threat, and it is up to you to decide whether you want to keep the add-on or not. However, if it was not your intention to install Arcade Frontier, then you should get rid of it immediately. The main Arcade Frontier homepage can be accessed via arcadefrontier.com. This website specializes in offering users various types of arcade games. Naturally, there is nothing wrong in playing online games, but you need to keep in mind, that such websites often display commercial third party ads in order to sustain themselves. 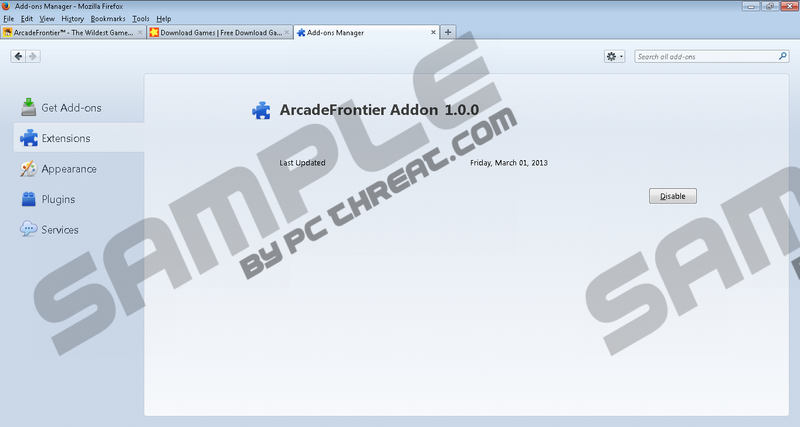 The Arcade Frontier add-on can be installed through the main website, but various reports claim that the application is often distributed bundled within Fusion installers, and it may come with YTDownloader, Retro Calculator, SpeedItUpFree, MyPCBackUp and a number of other applications. Arcade Frontier is considered to be identical to Arcade Safari, Great Arcade Hits, Arcade Parlor and other adware applications related to online gaming. As a result, Arcade Frontier can be easily removed via Control Panel. After manual removal, the add-ons are deleted from your browser automatically. However, if Arcade Frontier was installed onto your computer together with freeware, you should terminate other adware or potentially unwanted applications as well. Make use of SpyHunter free scanner and check your system for any undesirable applications. Invest in a licensed antimalware tool if you must, in order to safeguard to system from potential threats. Also, do not hesitate to leave us a comment below if you have any further questions. Open Uninstall a program and remove Arcade Frontier. Open Start menu click Control Panel. Select Uninstall a program and remove Arcade Frontier. Select Add or remove programs and uninstall Arcade Frontier. Quick & tested solution for Arcade Frontier removal.